Home | Publications| Encyclopedia | Asp, Henry E.
(3760, Frederick S. Barde Collection, OHS). 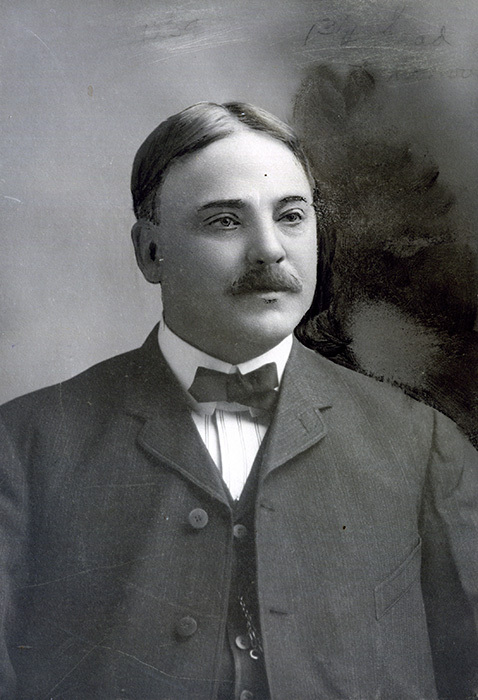 Henry E. Asp, Oklahoma attorney and politician, was born in New Boston, Illinois, on January 1, 1856. His Swedish-born parents, John and Christina Asp, died when he was young. Henry was reared by a guardian, who took him to Winfield, Kansas. As a youth he learned the trades of brick making and manufacturing of wooden pails. However, mechanics was not to his liking. Asp then studied law and was admitted to the Kansas bar in 1877. He practiced law in Winfield until July 1890 when he moved to Guthrie, Oklahoma Territory. Before he moved there, he married Nellie M. Powers of Winfield. They had one son, Alfred. From 1890 to 1907 Asp served as the solicitor and lobbyist for the Atchison, Topeka and Santa Fe Railway. In 1892 he established a partnership with two other Guthrie lawyers, John W. Shartel and James R. Cottingham. Their office handled some of the numerous land claim disputes after the Land Run of 1889. In the mid-1890s after the land cases had been settled, Asp represented divorce seekers who came to the territory to take advantage of the lenient divorce laws. In 1890 the Oklahoma Territorial Legislature provided for the establishment of the Territorial University in Norman. Asp was instrumental in founding the future University of Oklahoma and during its formative years served on its board of trustees. In 1893 he and university president David R. Boyd worked for federal legislation to provide that section thirteen of each township be set aside for higher education. For their efforts Asp and Boyd were honored by having streets around the University of Oklahoma named for them. Asp also became prominent in politics. In 1906 he spent seven months in Washington, D.C., lobbying for statehood, and he used his political influence to have Guthrie designated in the 1906 Enabling Act as the temporary capital after statehood. Returning home, he was elected to represent the twenty-fifth district at the Constitutional Convention held in Guthrie in November 1906. A Republican, Asp served on a number of committees, including the judiciary committee, and was the minority leader. Although Asp was identified with "public enemies" such as railroads and trusts, he was highly respected by Democratic convention leaders William H. Murray and Charles N. Haskell. Moving to Oklahoma City in 1912, Asp established the law firm of Asp, Snyder, Owen, and Lybrand. He worked at his firm until his death on July 1, 1923, in Oklahoma City following surgery the week before. Orben J. Casey, And Justice for All: The Legal Profession in Oklahoma, 1821–1989, ed. Odie B. Faulk (Oklahoma City: Oklahoma Heritage Association, 1989). Daily Oklahoman (Oklahoma City), 26 April 1914, 5 November 1982, and 2 July 1923. John P. Gilday and Mark H. Salt, eds., Oklahoma History, South of the Canadian: Historical and Biographical, Vol. 1 (Chicago: S. J. Clarke Publishing Co., 1925). Guthrie (Oklahoma Territory) Daily News, Special Edition, 20 December 1893. Oklahoma State Capital (Guthrie, Oklahoma Territory), 22 April 1904. "Passing Pioneers," The Chronicles of Oklahoma 1 (June 1923). Portrait and Biographical Record of Oklahoma (Chicago: Chapman Publishing Co., 1901). Linda D. Wilson, "Asp, Henry E.," The Encyclopedia of Oklahoma History and Culture, https://www.okhistory.org/publications/enc/entry.php?entry=AS007.